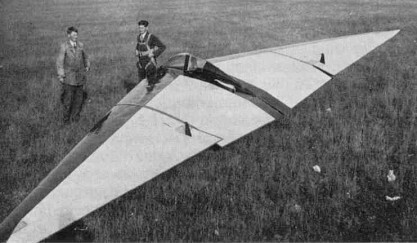 Reimar and Walter Horten started out with models, then progressing to gliders and eventually to powered aircraft. Their first tailless design, the Ho I sailplane. This was built at Bonn during the year 1931-1932 and had a flying life of about 7 hours. It had a span of 40 ft. and a wing loading of 2 lb/sq.ft. The control system comprised a control flap giving elevator control and normal ailerons at the wing tip. Directional control was by leading edge drag rudder at the wing tip. All the control flaps were hinged at the upper surface with a circular arc lower leading edge forming a seal with the wing. There was no aerodynamic balance. The wing section was symmetrical throughout and thick enough (25% C) at the center section to house most of the pilots body. His head projected from the upper surface and was faired by a perspex cockpit cover. A rubber mounted skid formed the undercarriage. The control system was unsatisfactory and was changed on subsequent aircraft. It seems to have been impossible to stop a slow speed turn by use of ailerons alone and the drag rudder, which at first was on the lower surface only, was ineffective and caused a nose down pitching moment. When an upper surface flap was added to cure this the braking action became too fierce and springs had to be incorporated to make the control heavier. Reference was made to a yawing tendency at low speed which could result in an uncontrollable turn through 360°. 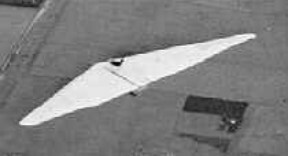 The Ho I sailplane, won a prize at the 1934 Rhon soaring competitions, but the brothers were not satisfied with its performance and burned it.